Automobile Parts Manufacturing Industries comprises of various companies who manufacture all the automobile parts. It includes the manufacturing of engines, body parts, electronics, steering, braking systems, and many more. Whereas, automobile parts stores are responsible for selling these parts to other companies or consumers directly. Economic expansion in the market is expected to boost the demand of auto manufacturing sector within a few years. This growth encourages the need for auto parts as well. China is the largest consumer of automobile parts in the world. It is followed by other countries such as the US, Japan, and Germany. The auto parts manufacturing industry in the US consists of nearly 4,300 companies with $265 billion annual revenue when combined. It illustrates you the vast opportunities in this segment. Hence if you wish to tap into this segment, we are here to help you. 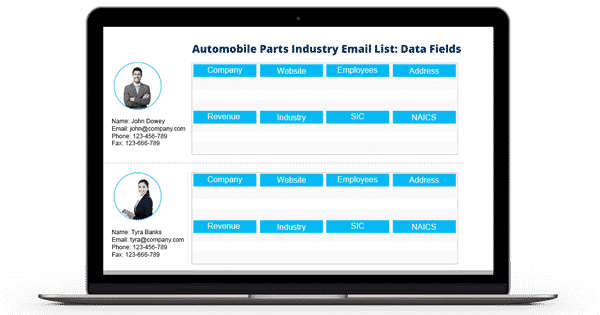 Blue Mail Media provides the best Automobile Parts Industry Mailing List that lets you seamlessly interact as well as do business with the decision makers of this field. We offer the list in both prepackaged and customized format for your benefit. Boost Your Company’s Growth to A Greater Heights Now! We, at Blue Mail Media, provide the world-class email list that lets you reach all the top decision-makers in various industries. Likewise, our Automobile Parts Stores Industry List offers you all the essential marketing information to stay connected with your potential prospects across the globe. Our list includes data from various regions such as the US, the UK, North America, Europe, Australia, Middle East, South Africa, and Asia. Whereas the data includes first name, last name, company, revenue, address, and more. Our team of data experts gathers all this data from authentic and internationally trusted sources. They are – yellow pages, business directories, government records, surveys, conferences, trade exhibitions, business meetings, and more. Hence you can trust the reliability of our Automobile Parts Industry Email Database fearlessly. Also, they verify as well as update the list once in every 90 days to keep it free of errors and redundancies. Apart from that, we also make sure that our database complies with rules and guidelines of Anti-Spam and GDPR policy. If you wish to see a drastic improvement in your sales figure and ROI, avail our Automobile Parts Industry Executives List now!